Employees who work at Laser Funds, a financial services company, must abide by many company policies to comply with federal regulations. In most cases, each employee must review and approve these policies regularly—either annually or semi-annually. 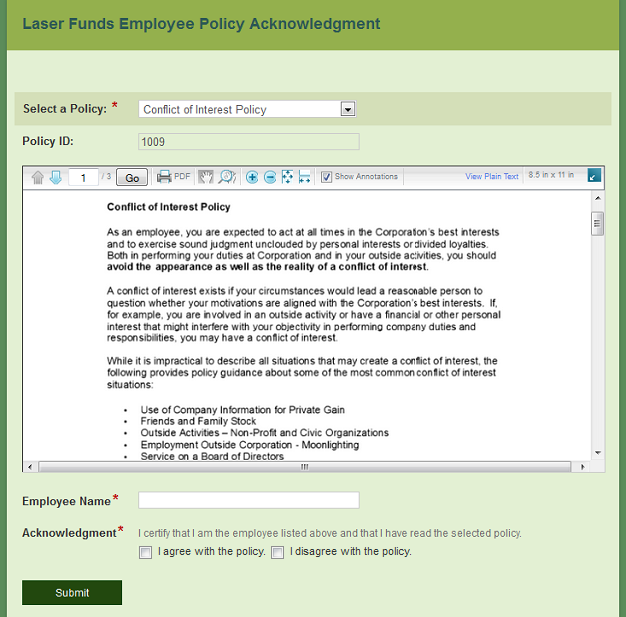 Laser Funds automated the policy acknowledgment process by integrating Laserfiche WebLink and Laserfiche Forms. When it is time for an employee to review and approve a particular policy, he receives an email with a link to the Laser Funds Employee Policy Acknowledgment form. After the employee selects the appropriate policy from the “Select a Policy” drop-down list, the policy document appears in the window below. The read-only “Policy ID” field is automatically populated with the document’s Laserfiche entry ID. The employee can read the document directly from the form or export it as a PDF. After reading the document, he signs the form by filling out the “Employee Name” field and certifies his agreement or disagreement by checking the appropriate box. Once the form is submitted, it is saved in the Laserfiche repository. Form data can be stored in a SQL database so administrators can track who has submitted forms and when they were submitted for auditing purposes. 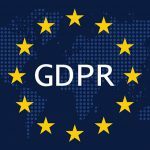 If the employee does not agree with the policy, the compliance department is notified via email so it can address the issue directly with the employee. In Laserfiche Forms, a Custom HTML field contains an iframe that links to Laserfiche WebLink, allowing users to view policy documents available in WebLink from within the form. 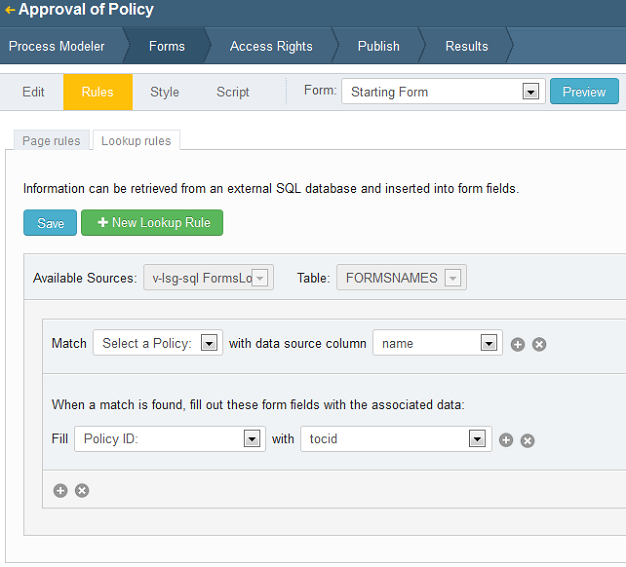 The “Policy ID” field, which is used in the script to select the correct Laserfiche policy to display, corresponds to the document’s Laserfiche entry ID. This field is populated by a database lookup into a custom SQL view (configured on the Rules page of the Form Designer). The process is configured in the Laserfiche Forms process modeler. An Email Service Task is used to configure the email to the compliance department. Employees do not have to navigate through multiple documents. The can simply read and acknowledge all polices form one form. Compliance officers are immediately notified if an employee disagrees with a policy and can follow up right away. Employees will always see the most updated version of the policy.